To solve these issues, Toshiba used a non-transparent metal electrode on one side of the panel. To still make the panel transparent, they arranged the metal electrodes in a thin (140?m-wide) stripe pattern. 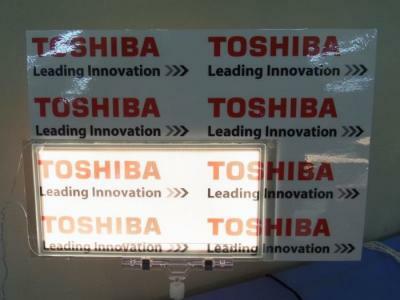 Toshiba is showing prototype panels that measure 180x90mm and 164x72 mm. These panels are 1.4 mm thick and feature a color temperature of 3300K and a brightness of 450-800 cd/m2. The transmission rate is 68%, and the efficiency is said to be 25.7 lm/W. One possible application for such panels are those spooky light-emitting glasses you see above. Apparently you can still see while using those panels which act as flash lights, of sorts. Toshiba says that such devices may be useful for dental treatments, aquariums and showcases.